IPL (Indian Premier League) season 11 will finally have Decision review system which was quite a buzz for very long time. Like in International Cricket, DRS will be given to each side with one number of times reviewing to unfold the decision of Umpire. Why is DRS Implemented in IPL 2018? What IPL Chairperson Shula Said to Media? Why are Captains not attending IPL Ceremony 2018? It is being done so to fuel up curiosity among the spectators and to add some twist in the games where technology combine with the captain decision making strategy on the field. As a cricketing fan, we have witnessed so many WhatsApp and Tweets about the Dhoni’s DRS and that to some extent invited IPL committee to implement replay system. On Wednesday during the press conference, IPL Chairperson Shukla confirmed about the DRS system news to media persons. Shukla said “Yes, this idea has been going around for many years,” putting his confirmation on technology-based decision making intervention in Cricket. Prior to IPL, replay system was adopted in PSL (Pakistan Super League) from this season and now with this IPL will attract much more spectators from all around the world. While taking to Media Rajeev Shukla announced good news about IPL entering into three years contract with TATA Nexon where latter will reward players with a good-great strike rate in the match and a Nexon Car to the player of the season with the highest striking rate. IPL inauguration function always knows to be dazzling and talk of the town till the season ends but this year fans will be disappointed that opening season will be held on the same day of the 1st match. BCCI has decided that barring Chennai super king and Mumbai Indians Captains, other teams Captains need not attend opening ceremony as it is scheduled on April 7th. 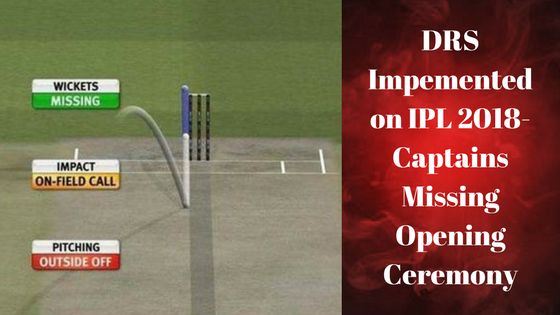 BCCI announced its decision after IPL governing committee decided to conduct opening ceremony before the first match. It has been decided so because IPL officials fall short in preparation by forgetting to address the logistic issue which could have to make IPL team captains easy to attend function going to be held at Mumbai. “There is a lack of preparing homework in booking flights in spite of knowing Chandigarh flights will be remaining close”. This IPL season 11 bought both peaks and valley on the table for the fans with the implementation of DRS and captains missing out to attend the opening ceremony. There is saying wax and wane add more species in any scenario of life with this Crix11.com will bring every update from IPL season 11.